ETP Studio for ITCH & OUCH provides a comprehensive tool-box for automated testing and simulation of trading APIs. ETP Studio for ITCH/GLIMPSE: our complete toolbox to test ITCH/GLIMPSE market-data feeds. ETP Studio for OUCH: our complete toolbox to test OUCH trading APIs. 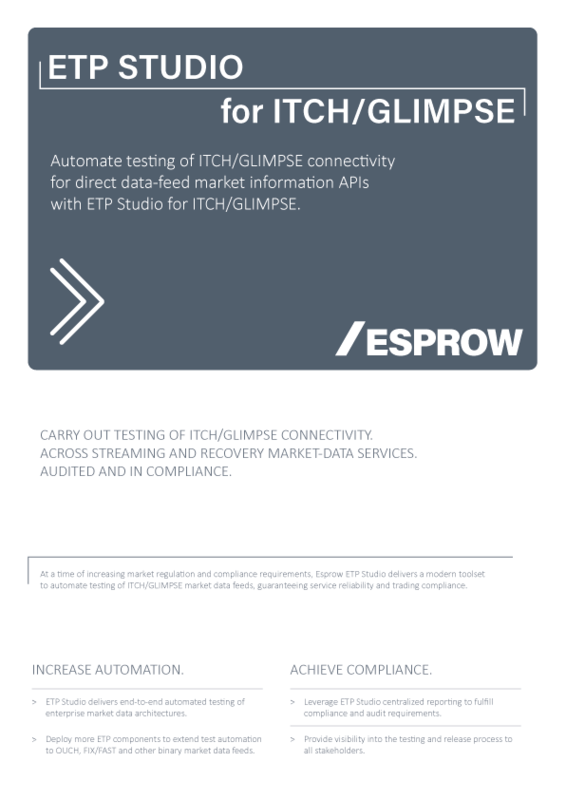 Automate testing of ITCH/GLIMPSE connectivity for direct data-feed market information APIs with ETP Studio for ITCH/GLIMPSE. Automate testing of OUCH trading connectivity, including custom message dictionaries, with ETP Studio for OUCH.